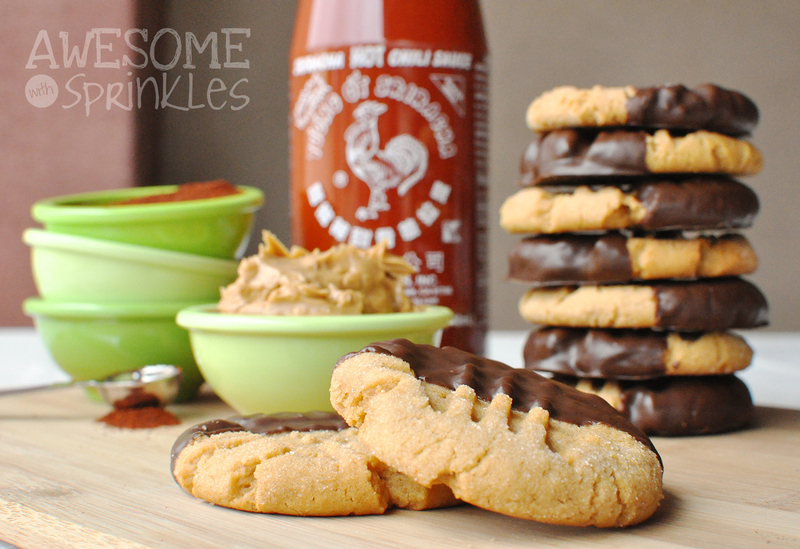 Sweet peanut curry with a drizzle of Sriracha was the inspiration for this cookie. 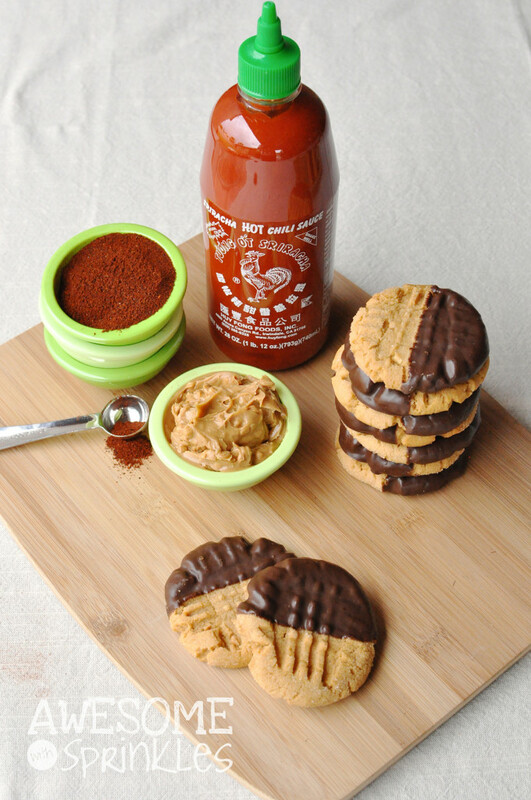 This is a basic, tried and true peanut butter cookie recipe is kicked up a notch with a dash of Sriracha. Then we take it up another notch with some chocolate chili, another sweet and savory flavor combination. And who doesn’t love peanut butter and chocolate. So much win all around. Oh, Sriracha…the condiment of condiments. THE original awesome sauce. This magical Rooster Sauce can be put it on pretty much everything to give it a little kick of awesome; pizza, fried eggs, potatoes, tacos, quiche, cheese dip, bloody marys, mac n cheese, popcorn, thai food, lip balm, candy canes, beer (yes, beer) and Sriracha in a cookie. Boom. Your life is now complete. 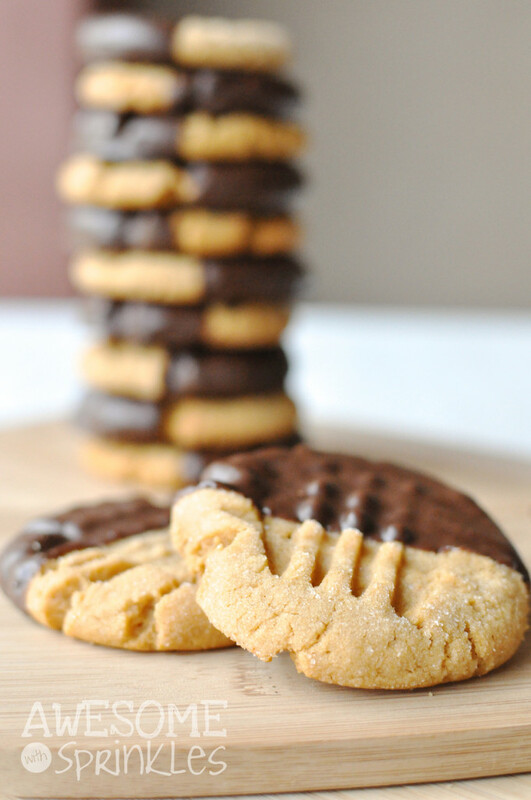 These cookies combine sweet chocolate and peanut buttery goodness with a slow burn of chili that sneaks up on you. If your taste buds had a mind it would be blown. For even more kick and a little extra crunchy texture try adding a tablespoon of crushed red peppers to your cookie dough! Pow! In a medium bowl mix together 2¾ flour, baking powder, baking soda and salt. Set aside. Using an electric or stand mixer, cream together butter, peanut butter and sugars until fluffy. Slowly add in Sriracha, eggs and vanilla. Beat until combined. a non-stick cookie sheet (or a baking sheet lined with parchment paper). Flatten each ball with a fork, making a fun, criss-cross pattern. Bake for 8-10 minutes or just until the cookies begin to brown. Cool on wire racks. depending on the brand of wafers used). Stir 1 tsp chili powder into 1 cup melted chocolate. 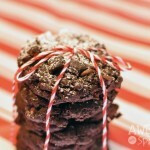 Dip cookies halfway into the chocolate, lift out and gently tap off any excess. 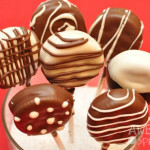 You may need to pop your melting chocolate back into the microwave periodically to soften it up as you go. As you use your chocolate up, continue to add more melting chocolate, 1 cup at a time (don’t forget to add another 1 tsp of chili powder for each cup of chocolate). Lay dipped cookies on wax paper and allow to cool completely until chocolate has set. Now it’s the time you have been waiting for -- CHOW TIME! Enjoy! WOW! These look and sound amazing! 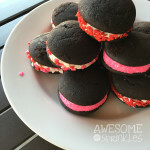 I was looking for a game changer recipe for Valentines day and I am pretty sure I found it! Thanks so much!